Whether or not, you are on the job site or back in the office, this book will help you to avoid mistakes, code violations, and wasted time and money. The book’s four part treatment begins with constituent materials followed by self contained parts on Concrete Properties, Processes, and Concrete Repair and Rehabilitation. Designed to be an "all in one" reference, the author includes a wealth information for the most popular types of testing. This includes: Analysis of Fresh Concrete; Testing Machines; Accelerated Testing Methods; Analysis of Hardened Concrete and Mortar; Core Sampling and Testing; Assessment of Concrete Construction ; Repair; Quality Concepts; Quality Control; Statistics; Standards, Specifications, and Codes of Practice. 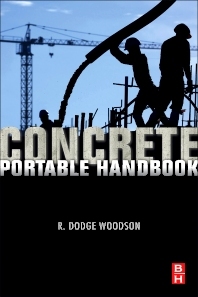 With this book in hand, construction engineers and even technicians find valuable information regarding Exposed Concrete Finishes, Repairing Concrete, Formwork, Precast Concrete, Concrete Roads, and Industrial Floors. Project managers and owners will find this reference a valuable guide to concrete both in terms of its applications in construction projects and the science and chemistry of concrete for its own sake. Chapter 18. How Much Do You Know? What Does Osha’s Concrete and Masonry Standard Cover? What are the Key, New Changes to The Standard? What are the components Of The new Standard? What are the General Requirements of the Standard? What are the Requirements for Cast-in-Place Concrete? What Other help can Osha Provide?